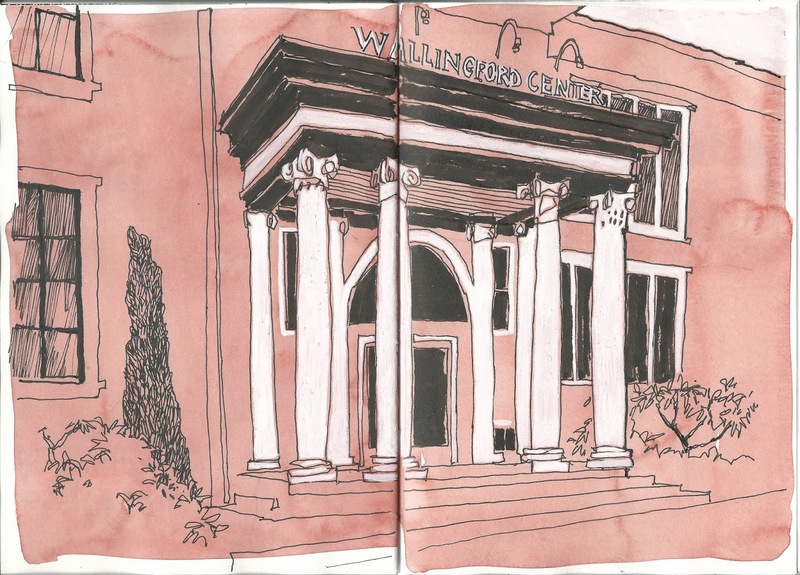 We had a terrific turnout of about 22-24 people to sketch at the Wallingford Center today. Guest hosts Kathleen Keckler and myself (Sue Heston) managed to herd 18 down to the central staircase for the group photo, but I know we lost a few on the way! There were also 5 or 6 new and newish sketchers, so Welcome! It was a chilly morning, not quite drizzling, but several people sketched outside anyway. I settled on this view of the main entrance with it's graphic white columns and black trim. Those doors lead directly into Trophy - a decadent cupcake shop which several of us got lured into. Don't say you weren't warned! Am following and enjoying your posts. Thanks for sharing! I enjoy viewing Urban's sketchers as it makes my day, I learn some things, and I enjoy your comments.